Wijk aan Zee: shared third with Anand, 0.5 from first (Aronian/Carlsen). Ahead of Topalov, Kramnik, Ivanchuk, Leko. Won against Anand. Sochi: second, 0.5 from first (Aronian). Ahead of Ivanchuk, Wang Yue, Svidler, Kamsky, Grischuk. Won against Karjakin. Sofia: third, 2.5 from first (Ivanchuk) but 2.5 ahead of last (Aronian). Won against Aronian. Elista: shared first (with Grischuk and Jakovenko), 1.5 ahead of Leko, Wang Yue, Mamedyarov. Won against Alekseev. Linares: even score, 1.5 from first (Anand), ahead of Ivanchuk, Leko, Shirov. Won against Carlsen. ACP Rapid World Cup: first, beating Ivanchuk, Jakovenko and Grischuk in the final minimatches. The Grand Prix event originally supposed to be held in Doha, Qatar, was moved to Elista and finished with three players sharing first: Radjabov, Jakovenko and Grischuk. In a strong field with an average rating of 2713 Radjabov won four games and lost once, against last placed Inarkiev, after a mistake in a winning position in time trouble. His Elo performance in the event was close to 2800 and at the end of the year his position on the live rating list is 6th, between Ivanchuk and Kramnik. 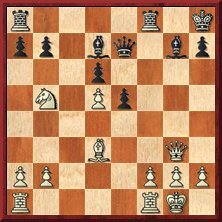 The King’s Indian Defense is what Radjabov is most famous for when it comes to openings. He has won dozens of games with it over the last years, for example against as strong players as Ivanchuk, Topalov, Aronian, Shirov, Gelfand (twice in 2008) and Ponomariov. He has also drawn his three games with the opening against Kramnik. In his starts in Corus A (2003, 2007 and 2008) Radjabov has in total 8 wins and 3 losses with black, all the wins coming with the King’s Indian Defense. Radjabov has three losses with the King’s Indian in the same period, against Shirov, Wang Yue and van Wely. That makes his stats with the opening (from the black side) an impressive +13 -3 =16 in 2007-08, four of the draws coming against Kramnik and Ivanchuk. Several games are hybrids between different openings, and depending on the definition of a KID one could get a win or loss more over these years. Comments (by GM Mikhalevski) on some of Radjabov’s KID games can be found at ChessPublishing.com. Radjabov scored 23 wins with black in 2007-08, and had a total of +23 -12 =43. As a comparison another very strong player with black, Viswanathan Anand, has +12 -6 =32 in 2007-08 (years during which he won both Linares and the World Championship twice). The previous World Champion Vladimir Kramnik has +0 -7 =44 since his last win with black in 2006. The last year that Radjabov had a minus score with the colour was in 2003, when he won against among others Kasparov, Anand, Ponomariov and Gelfand but lost some more games (against for example Anand, Kramnik, Leko, Grischuk and Bareev). That year he was often outrated with 100-200 points by his opponents in tournaments like Corus, Linares and Dortmund. Playing with white has sometimes been more of a problem for Radjabov, comparatively speaking. In 2007 he scored +4 with white while he had +7 with black. At the same time Radjabov’s “weak” results with white shouldn’t be exaggerated. In 2005 he scored well over +10 with white, in 2006 it was 9 wins and only one loss. In 2008 it ended up with 12 wins and 4 losses, three of the latter coming in Baku where he was out of shape after having a very tough playing schedule in the first half of the year.